I have puny eyelashes. I have spent most of my young adult life trying to find a magic mascara that will suddenly inflate my lashes to doll-like proportions As of now, I have yet to find that magic formula, but I have found combinations of mascaras, plus a couple tricks. that make my eyes look bigger and my lashes lush. Translation: Here is how to fake your way to nice eyelashes. What you'll need: two mascaras (one for length and one for volume works best), black liner (liquid works best for me), an eyelash curler, and a hair dryer. 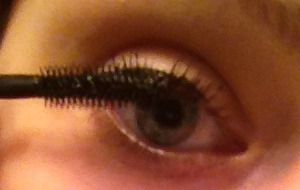 Step 3 lengthening mascara. Get in them corners. Step 1: Line your upper lids with black liner. Keep the line close to your lashes and try not to get it too thick, because then it will overwhelm your lashes (cat eye is a cute look too, just not the one we're concentrating on.) A thin line of black makes your lashes look thicker because it provides a darker base. Step 4 volume mascara. See what I mean about the bending backwards? 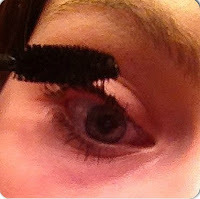 Step 3: Apply the lengthening mascara, brushing it over the top of your lashes as well as the bottom. Putting mascara on both sides of your lashes makes a better bond, which makes them look longer. Make sure you get the tiny lashes near the corners of your eyes. They normally get ignored, and when you make sure you get them it makes a big difference. Step 4: Apply volume mascara. This is what really pumps up your lashes and makes them look bigger than they would otherwise. With this step, really concentrate on the ends of your lashes - use the brush to almost bend them back and bounce it up and down a couple times. This amplifies the curl and makes 'em big! Now you have big ol' dolly lashes with nothing fake stuck in your eyeballs. You're welcome.